Cheapest deals on Split hotels. Book now! The train station in Split is conveniently located right next to the bus station and within a kilometre of the ferry port and about the same from Diocletian's Palace. Although it's not a particularly scenic place to hang out, everything you need from snacks to ATMs is right within reach. Also, the station is open long hours and there are left-luggage lockers (15Kn daily). Although no international trains to Split bypass Zagreb completely, trains from Budapest, Prague, Belgrade and Vienna make only a stop in Zagreb on their way to the coast in the summer. The rest of the year, you'll need to change trains in Zagreb. There is no train connection from Split to Dubrovnik and no train connection north to Istria. There are two daily trains from Split to Zagreb (6 1/2 hours) and one or two (during the summer) overnight trains (8 1/2 hours). The advantage of taking an overnight train from Zagreb to Split, as opposed to the bus which is much faster, is that it gets you to Split early in morning. Perfect if you want to get the next ferry out to the islands! Another advantage to taking the train from Zagreb to Split is that you can bring your bicycle aboard which is not possible on the buses. Travelling with your pet? No problem. Dogs, cats and other small animals are allowed on board if properly leashed or caged. I've taken the two-bed sleeping car from Zagreb to Split and found it a relatively comfortable experience. Naturally, the compartments are cramped but there is a sink, soap, a bottle of water and a croissant to go with the coffee that is served in the morning. 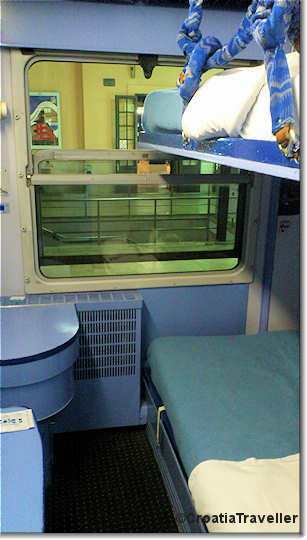 Towels are not included, toilets are shared and there is no air-conditioning and no dining car. You can book domestic train tickets online at the Croatian Railways site. The supply of train tickets vastly exceeds the demand so it's normally not a problem to pick up tickets at the train station last minute either. You can pay by cash (kuna or euros) or credit card.